The Walton Road – a route that evolved from portions of Tahlonteeskee’s Trail, Avery Trace and Emery Road - was an early pioneer trail that traversed the Cumberland Plateau used by explorers, hunting parties, and eventually settlers moving to start a new life in the Southwest Frontier. 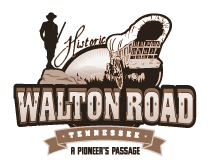 As one of the earliest wagon roads over the rugged Cumberland Plateau, the Walton Road tells an important story of frontier settlement, the challenges of migration across the wilderness, and the forging of a national identity. 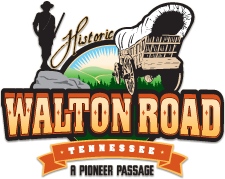 The Walton Road, opened in 1801 and named after its builder, Revolutionary War veteran Captain William Walton, is one of the most historic pioneer roads in the Cumberland Plateau region of Tennessee and Kentucky. The historical routes associated with the Walton Road crossed the Cumberland Plateau linking Fort Southwest Point at the confluence of the Clinch and Tennessee Rivers with the Middle and Upper Cumberland River settlements at the confluence of the Caney Fork and Cumberland Rivers near present-day Carthage, Smith County. The Walton Road closely followed the path of the Cumberland Trace, or Tahlonteeskee’s Trail, named after a Cherokee chief whose village was near the site of modern day Rockwood. The route of the Walton Road has been used for millennia, and parts of it are now incorporated into U.S. Highway 70, and Interstate 40; but sections of the original road can still be seen in isolated areas of the Cumberland Plateau and Eastern Highland Rim.